I was successful, thanks to my mother. Skip Worchester on how caregiving can also unearth difficult emotions. 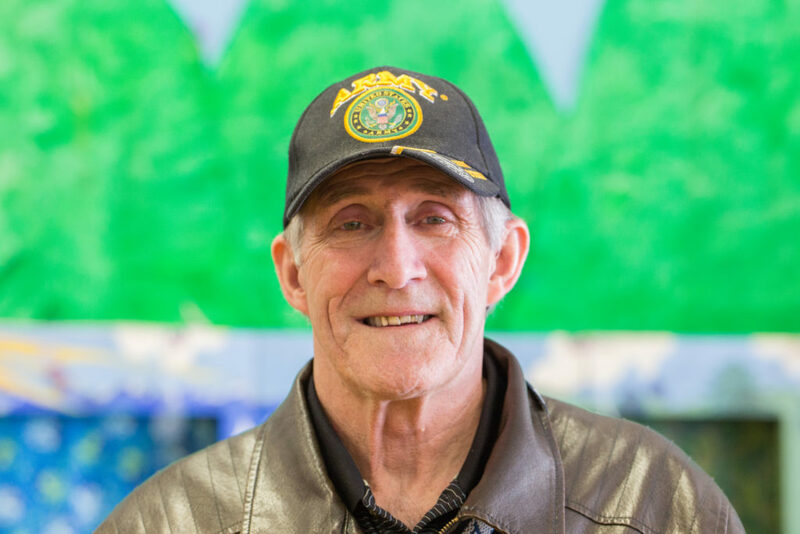 Skip Worchester is a 72 year old veteran, family caregiver, and elder from Hermon, Maine. Skip cared for his mother and was proud to do it. Partly because he gives his mom so much credit for his own success, he also battled with feelings of shame and guilt brought up by the difficulty in simply making ends meet for the family. Because of what it would have meant for his own family, Skip is working hard for the Homecare for All initiative on the Maine ballot this November 6th. When I was a child, I worked very hard, and my mother was a big part of that. My family and I worked picking blueberries and potatoes. In the summer we would dig clams and in the winter we would cut wood. I started cutting wood at eight years old, and I had polio when I was nine. I donated all of my earnings to the family for my clothes. I can remember, as a child, sleeping on the dirt floor of an old garage. We had a hard life. My mom was very smart, and she always prized intelligence. My mom would sit at the window of our home (that only had running water and electricity years after we lived there) and read books to me before I went into school. Because of her, I was the first in my family to get my degree from college. When my mother was forty years old, she got a job as a postmaster. She saved enough for her retirement and retired after twenty years working at the post office. Sadly, she was not able to enjoy it. As she got older, she got more and more ill. My father took care of her as long as he could, but at a certain point he couldn’t take care of her anymore. He did all he could. We had no other choice than to put her in a nursing home. It was hard for me to see her often. I was working in Waterville and would travel back down east to Milbridge. I had to travel 75 miles one way just to see her and I was working sometimes 5-6 days a week. Fortunately, my father lived about 7 miles away so he was able to see her regularly. Also, my first wife was working at that nursing home, so she had visitors and family visiting fairly regularly. The nursing home did as much as they could do. When my mom had had the care she needed, she always bounced back. When she was a child, she had an abscess, and she was not supposed to live. When she was fourteen, the doctors sent her home to die. She was pronounced dead during one of her births on the birthing table – was given a complete blood transfusion. My grandmother took care of her and hired a nurse and my mother was able to live and thrive. But her being in a nursing home was different. Even though the nursing home was run fairly well, she would always mention wanting to go home. I always felt so bad when she would say that. Every time I saw her she would hold my hand and we would talk about how everything was going for the family – I wished she could have been there to see for herself. It always bothered me that she wanted to come home but she couldn’t. I was ashamed – I did not have enough money to help her. My sister and I were just not making enough money at that time. I was working as a rural mail carrier and my sister was a radiology nurse. My mom ended up using all of her money – it took every bit of money she had. She lost everything in a way and really got worse in the nursing home and eventually died there. Less than a month later, my father passed. He died of pneumonia. When she died he gave up all together. I wish we had had homecare, but at that time it was not an option. It always bothered me that she didn’t have that choice. I saw firsthand how important it is to have good systems of family care in place. I saw my mother deteriorate, away from her home where she wanted to be, which I wouldn’t wish on anyone. Both my sister and I were successful, thanks to our mother. She taught me how to put my nose to the grindstone, and she taught my sister about how to make the best of what you are given. I am a part of Maine Homecare for All because of what happened then. I jumped on board immediately. I am working to pass Maine Homecare for All in her memory. Follow the stories and experiences of Skip and others and join in the conversations about how we create community and break the isolation of caregivers on our Facebook page and on Twitter using the hashtags #WeKnowYouCare and #NationalCaregiversMonth.